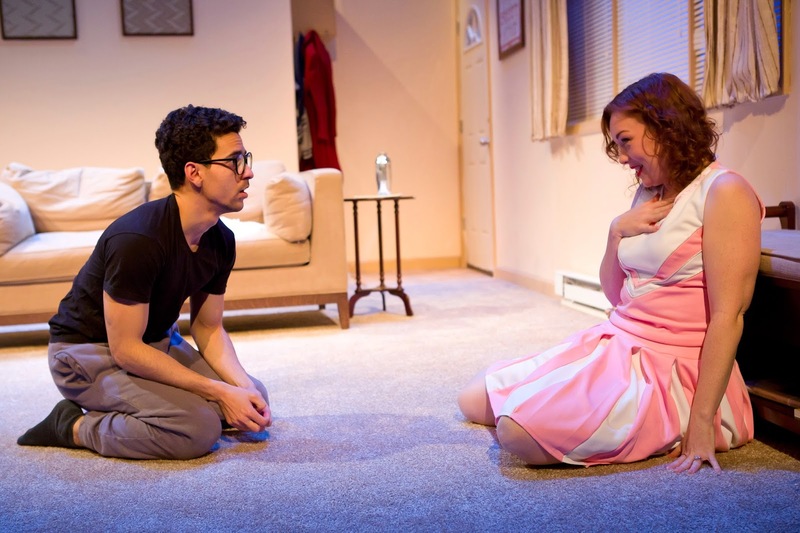 Theater in the Now: Review: Who Needs Rationale? Sometimes the lives we lead are not exactly what we want. So in order to make them what we want, we pursue other ventures that get us there. In Ross Howard’s No One Loves Us Here, a bevy of characters pursue new ambitions that may or may not involve the lives of those around them. Rationale and reason are out the window in this bizarre dark comedy. Established like a trashy soap, No One Loves Us Here tackles death, infidelity, and a whole slew of drama-filled topics when a mysterious young man turns the Beaumont's world upside down. Washington, a nineteen year old who works in a video store, a virtually non existent work place, knocks on the door of a well-to-do couple and manages to convince them to allow him to reside in their guest house. What follows is a quick succession of scheming and smack talk that results in the unthinkable. Ross Howard's script is a well-planned idea that is executed in an unfortunate way. The characters that he depicts are larger than life but they often fall short in their execution. Director Jerry Heymann seemed to miss the brand of comedy Howard was going for, thus makes the production a bit messy on the whole. The situation that Howard places his characters in is quite funny and over-the-top. But without an equal heightened approach, the drama comes across as drama and not the comedy that it truly wants to be. The rationale of these seemingly complete strangers allowing another stranger live with them is incomprehensible but without this bit of plot I suppose this play couldn’t further. Though Heymann’s direction seemed to confuse the actors’ approach, Jessica Kitchens’ seemed to be the only one who tackled the heightened hilarity. Her boozy housewife was desperate for attention and by the end of Act II, her deadpan delivery proved that this could have been an even stronger show if her costars matched her. April Kidwell, a top-notch comedian, scraped the surface of bold. Kidwell’s Amber was a wonderful “other woman” but it seemed as if she was being asked to hold back. Anthony Michael Irizarry as Washington had such rich potential but also seemed to be lacking. What he did present was pretty noble. Director Heymann missed the mark to bring this production to its full potential. From a design standpoint, Heymann’s team brushed the surface of possibility. Set designer Brian Dudkiewicz created a generic American living room, bland carpet, decor and all. For a couple that was supposedly of a high monetary class, the room did not reflect it. Despite that, poorly constructed walls with noticeable seams drew attention away from the action. Costume designer Samantha Lind gave the characters little personality. Had Heymann’s vision been clearer, perhaps this colorful play would have been reflected in the overall production design. While some may love this play, there was just something off in No One Loves Us Here. Howard’s script had substance but Heymann’s direction didn’t quite match it. In the hands of another eye, perhaps the nuances of comedy would have been perfected, but as it stands now, New Light Theater Project’s production was just not up to par.